Concrete siding or fiber cement siding sometimes cannot be distinguished from wood siding. This type of siding offers several advantages over other types of siding and will add value and elegance to your project. Concrete siding also know as Hardie plank siding, due to its inventor, can be a great alternative to vinyl and wood siding. Concrete siding are straight boards heavier than wood siding and although flexible, Hardie plank needs to be handled with care otherwise, it might get damaged. The installation of concrete siding is a task that should be completed by at least two workers unless we are dealing with small siding pieces. Manufacturers of concrete siding offer Installation guidelines to help during the cutting and handling process, especially when managing cement siding when it is wet. Special tools and additional labor are required to cut the siding adding cost to your projects, so consider this during the bid process. Is Concrete Siding the Best Solution for my Project? Fiber cement siding is a cost effective material that will simulate and can replace wood siding. This type of siding requires little to no maintenance, free of termite and provide fire protection as well. One of the most important attributes of the fiber cement siding is that it can withstand variations in weather conditions, such as snow, ice, heat and freezing temperature without decaying. One of the greatest advantages of concrete siding is that unlike wood or vinyl siding, requires little to no maintenance, so there is no need to clean and wash constantly. When installing fiber cement sidings do not overdrive fasteners into the siding. Choose corrosion-resistant nails, stainless steel nails are the best ones, but they might be somewhat expensive. Round-head nails will provide optimum results. Verify that all fasteners are installed properly and driven into the framing members. 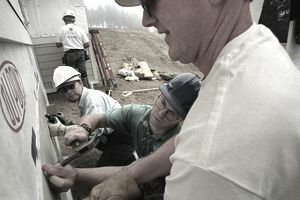 Fiber-cement lap siding should be joined by a stud. Always make sure to leave a small gap between the siding and the edge of the wood casings and corner boards allowing the wood to move when needed. Although concrete siding has many advantages it might present some drawbacks too. For example, installation and handling costs are higher when compared to vinyl siding. As a matter of fact, you will have at least twice the workers installing fiber cement siding than if you were to use vinyl siding.